The world-picture of the Movement of Wholeness is essentially esthetic. It is, in the deepest sense of the word, a poem � the Poem of Being. The Movement of Wholeness has form and symmetry, and the relation between the principles of Unity and Multiplicity develops in a cyclic counterpoint; Wholeness is the great Harmony of Being. Harmony, though implying contrast, transcends the realm of conflict � for in situations of conflict human beings too often see themselves as antagonists seeking to destroy one another's right to be. 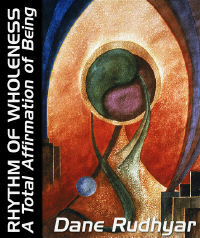 Wholeness requires that opposites be seen as "co-being" in a state of perpetual meaningfulness. Nevertheless, at any particular phase or moment of the cyclic process, an ethical situation can be readily perceived, which at the human level involves a "moral" choice. Every human being to some extent can, and therefore must, choose between flowing with the movement or resisting it. Whether in full consciousness or in a mostly unconscious state, the individual either orients his or her being (or at least the central component of it) in the direction of the next evolutionary phase of the cycle of Man, or stubbornly (even if unconsciously) clings to the values and way of life the present phase of evolution has already left behind. Evolutionary "success" simply means conscious attunement to the Movement of Wholeness and the deliberate attempt to actualize in one's consciousness and activity the potential realizations and values Inherent in the next evolutionary step. Failure, on the other hand, results from the inability to let go of the past because the mind, the ego-will, and the physical habits refuse to change radically enough, or at least to be used in the service of emergent new ideals and concepts. Nevertheless, a few principles of conduct remain basic throughout the whole period of human evolution. They persist because they are essential characteristics of the direction in which the evolutionary cycle moves after the symbolic Noon is reached. At such a time (as we already have seen) the "descent" of the power of the Godhead state occurs by means of a series of Avatars, in and through whom the archetypal Image of Man acquires existential and objective form. The period of the Movement of Wholeness between Noon and Sunset is primarily the period of actualization of the potential inherent in this archetypal human Image. Therefore, the one essential dharma of all human beings is to pass from the condition of Natural Man to that of Illumined Man by allowing the rising power of the principle of Unity to become focused into their total being. However, although all human beings potentially can reach Illumination, they will not all do so. This must be accepted unemotionally and, above all, be understood: there must be failures as well as successes. Once the possibility to move ahead and take the next evolutionary step presents itself to an individual, he or she must respond to this possibility deliberately. At the same time, resistance inevitably takes form, if not in the whole person at least in some of the components inherent in generic human nature (that is, in the nature shared by all human beings). Motion always develops inertia in whatever has form. From a slightly different perspective, this also means that whenever a new mode of energy is released, the inertia inherent in the forms given to the old, familiar mode inevitably manifests as the negative or more or less destructive use of the energy newly released. Since the Industrial Revolution began to release new forms of power at a tremendously accelerated pace more than a hundred and fifty years ago, and since the more recent release of potentially devastating nuclear energy, mankind has had squarely to face this fact. Even the Bible alludes to the inevitability of failures when the "Lord God" states that in a particular situation he will set apart and test for their ability to survive one third of human beings, while the other two-thirds will perish. (1) "God" does not seem to care which human beings will be saved but is only intent on having "one third" given the special chance. Whether the ratio is basic or refers only to a particular historical or symbolic situation is not important here. In the Gospel (Matthew 18:7) Jesus is also made to say, "It needs must be that offences come; but woe to that man by whom the offence cometh." Failures must occur, because if there were none, the universe as a whole would reach perfection and, in the Godhead, absolute oneness. Thus there would be no cause for divine. Compassion and no Idea of a new universe. But absolute Unity is impossible, because if the principle of Multiplicity were absolutely defeated, there could be no world of existence. It makes little sense to say that a new universe periodically emerges from an absolute One who desires it. If a "desire for manifestation" is inherent in this absolute One, then obviously He or It is not absolutely One � only relatively so. No "desire" for multiplicity could operate in a state of absolute, timeless unity and omnipotence. To speak of a sublime mystery in this connection is as meaningless as to say that the world is ruled by chance. An element of chance must operate in the universe, otherwise order, if unchallenged, would lead to absolute repetitiveness, to a Nietzschean Eternal Return. On the other hand, the total absence of a principle of order would render impossible any process with a definite character and goal. Although the same structural principles operate in every cycle of being, events are not repeated exactly, because the factor of relatedness enters at every step of cyclic evolution. As Wholeness is indefinable, so are the possibilities of relationships. Moreover, an element of unpredictability is involved in all existence, because during the half-cycle of existence the principle of Multiplicity dominates the world stage, creating a sense of infinity � that is, the feeling that anything and everything is possible. The principle of Multiplicity manifests as the desire for existence as a separate being. Even in the postmortem state of inistence, this desire retains some of its strength. In another sense, the principle of Multiplicity manifests in "ghosts" � many kinds of ghosts at many levels of being. All memories of experiences of relationship are, in the broadest sense of the term, ghosts. There are ghosts � memories of the failures of the past � even in the nearly total oneness of the supreme consciousness of the Godhead. They arouse divine Compassion, which is the realization by oneness that multiplicity cannot be dismissed. The past cannot be dismissed; it inheres in the present � in any present moment. Failure cannot be dismissed; it is a ghostly presence in any success. Not only does the death of any relationship lurk in its birth � however ecstatic this birthing may be � but the failures of relatedness, small or large, are potential in the moment of greatest happiness and experienced oneness. These facts must be accepted, but accepted in the vivid and enduring consciousness of the meaning they can reveal to an open mind � to the mind of wholeness. In that mind, failures and successes move eternally in a steady and unemotional counterpoint that constitutes the supreme antiphony of being.